Since 1993, we have helped people invest in themselves and their communities through affordable homeownership. Warren County Habitat for Humanity sells homes to income-eligible households. Our homes are sold at no profit, with an interest-free mortgage. Approved homeowners qualify for a monthly mortgage payment (principal, property tax, insurance, and HOA fee if applicable) equal to less than 33% of their monthly income. This investment in affordable homeownership strengthens our communities and families and revitalizes local neighborhoods. At the beginning of each calendar year we refresh the list of people interested in applying for our Homeownership Program. Please complete the questionnaire by clicking the blue button below to determine if you meet the general requirements for eligibility. Completing this questionnaire allows Warren County Habitat to capture your contact information so we may contact you with updates on our next application cycle and estimated construction timelines. The questionnaire is not an application for homeownership and does not constitute application to any Warren County Habitat for Humanity program. It serves to qualify your interest in applying when we open our next application cycle. The homeownership process, from the time of family selection through construction and sweat equity, can take up to two years. At least once a year Warren County Habitat opens an application cycle. This cycle is no longer than one month in duration and punctuated by a deadline for application submission. WCHFH hosts several Homeownership Program orientation sessions when an application cycle begins. During the orientation, you can learn more about the properties available, the process for homeownership consideration, and deadlines for your application submission. Applications are distributed at the program orientation sessions or may be retrieved at our Front Royal office during an application cycle. Applications are not accepted after a deadline or prior to the beginning of a new application cycle. 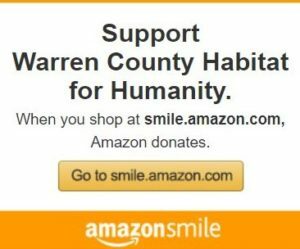 Sweat equity is part of Warren County Habitat for Humanity’s foundation. It is the volunteer labor that Warren County Habitat homeowners contribute to building their own homes or other Habitat homes, and the time they spend in financial and homeowner education courses. Homeowners begin working on sweat equity after they are selected as future Warren County Habitat homeowners and must complete their hours before they move into their new homes. Applicant(s) has not owned a home within the past three years. Household must have lived together consistently for the past 12 months. Applicant(s) cannot qualify for a conventional mortgage loan. 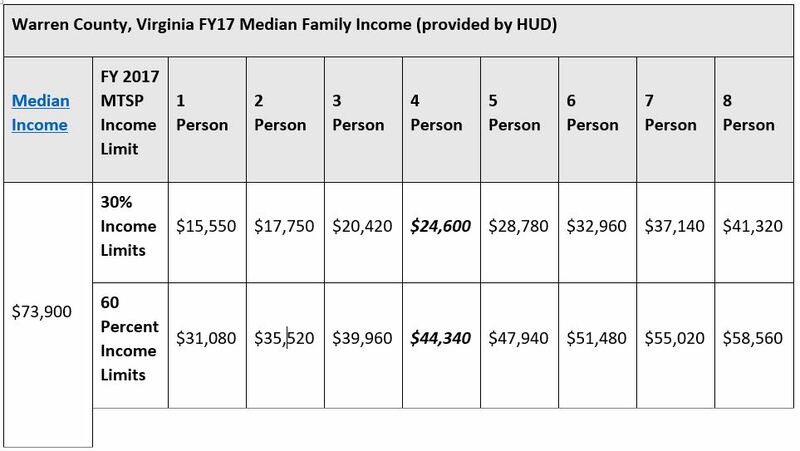 Household’s annual gross income is no more than 60% of the area median income (AMI) and no less than 30% of the area median income (AMI).